How do various markets define ‘wealth’? What are customers’ personal aspirations? How is this idea locally relevant? Are our creative proposals appropriate in the context of local cultures? By calling upon our highly vetted talent pool based in the local markets, we were able to provide Barclays with accurate feedback, fascinating insights and intelligent suggestions. 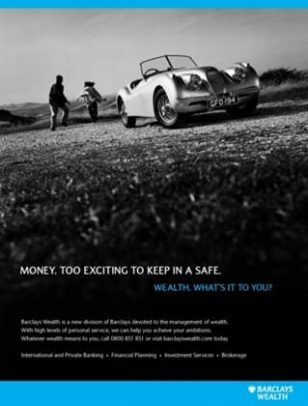 Textappeal checked every concept, visual and copyline developed by Barclays Wealth’s agency – for example, one of the key insights our research showed was that the originally proposed creative (with a vintage Jaguar, used for the UK) was actually quite irrelevant to the Chinese market, where ‘vintage’ is seen instead as ‘old’. 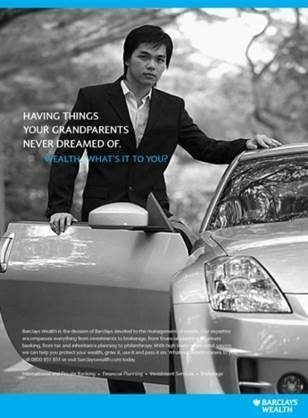 Investors would not associate the purchase of an old car with wealth or a wise investment, and so the idea was rejected for this particular market. Thanks to our reported findings, a new creative route was developed – opting instead for a brand new sports car. The new creative would resonate more closely with local values and understanding of wealth, thus enabling the agency to deliver much more effective target advertising.